One of the questions that are often asked among artists is why Wacom graphics tablets are so expensive, the same goes to their pen displays like Cintiq. Usually when someone shop for a graphics tablet, especially for the first time, chances that they will see a price gap between Wacom’s & non-Wacom tablets, which makes you wonder if the price difference is worth it, and if there is an actual difference between Wacom’s products & the other ones, or if they are just overpriced. In this article, I will show you my speculation on why that’s the case. And as I just mentioned, these are just speculations, but they will hopefully shed some light on this issue. Wacom’s graphics tablets are known that they last longer, it is not uncommon to see people who still uses Intuos2 tablets in 2016, despite how very old that model is (Intuos2 was released in 2001). 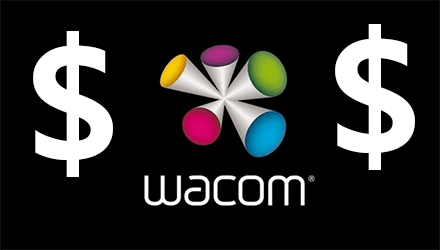 That amount of trust, along with their build quality, makes Wacom’s products suitable for professional use, and in that regard, they are not that really expensive. Even if the other graphics tablet manufacturers started to produce the greatest tablets ever with the best driver support. It will still take them quite some time to gain the recognition they deserve. The opposite kinda goes for the non-Wacom graphics tablets, I have reviewed many of them in this blog, many of them were actually good, especially for non-professional usage. But you still hear some people who say they fall apart easily or have bad drivers (which is partly true), so it will be some time before these products gain enough brand recognition to reverse the tide in their favor. Some may say there is not competition to Wacom at all, but that’s not exactly the case, as there are many alternatives out there, but the lack of brand recognition makes it unclear where to go to other than Wacom. Compare this to the operating systems market, those are sick of Windows can switch to Mac OSX & vice versa. Both systems have a lot of recognition that they are easy to identify. When it comes to graphics tablets, there is only one recognized name out there. Sure, there is a lack in competition in many other areas, for example, for a long time, Wacom was one of very few manufacturers of large graphics tablets & pen displays, so that made them the only choice for those who want a large drawing area (And again, this is slowly changing, Huion now has a large graphics tablet called Huion Giano for example). While many of the other graphics tablets has a 2048 level of pressure sensitivity, this feature is not enough to compare graphics tablets. Actually, very few people need more pressure sensitivity above 512. The overall build & the accurate feeling of Wacom’s makes them a great choice for those who want to make detailed art. Wacom also has unique technologies that no other manufacturers has, like the pens that requires no charging, because they had patent for it for years, while the patent for this has expired, it will take the competition some time before they will provide a similar feature. When it comes to the professional Wacom products, like the Intuos Pro, they provide some features that are yet to be seen in the competitors, like Tilt sensitivity, while most artists don’t use that feature as far as I know. Those who do have no choice but to go to Wacom. And by great driver support, I don’t mean that their drivers are flawless, I am very aware how sometimes their drivers are frustrating. But I am more referring to the amount of time their driver keep receiving updates. The Graphire 3, which was released in 2003, kept getting driver updates until 2014, which means Wacom kept releasing updates for 11 years. It works with Windows 8 according to Wacom’s drivers download page. While the driver hasn’t been updated for 2 years at the time of writing this article, if you don’t mind using Windows 8 or an earlier version of it, you would be now using your tablet for 13 years straight. Similar to the Graphire 3, the Intuos 2, which was released in 2001, received drivers for 11 until 2012. And works with Windows 7 and all the earlier versions of it. The older Graphire 1 tablet, released in 2001, had shorter support time. The drivers were released until 2007, and works with Windows Vista & earlier, that’s 6 years of support. This makes me think that Wacom support their products longer than they used to in the past, which is a good thing for them. We are yet to see if the other graphics tablets manufacturer can offer something along with that, as they haven’t been in the market for that long compared to Wacom. But who knows, maybe they will do. I hope this article has answered your question on why Wacom’s products are more expensive. While I hopefully didn’t seem like I am defending Wacom or anything, but they clearly have many advantages over their competitors right now. Like I kept saying, these advantages may disappear after some time, but we are yet to see that. Many of the points I made in this article overlap, and from what I see, they all come together to create the situation we are in. Which will hopefully change for the better of art creation. What I like from wacom is the driver, they’re the best, when new OS or new adobe version release, wacom will update their driver in a week. Like others Japanese products, I think they’re expensive because of research cost for their engineer. Honestly they’re overprice compare to their product qualities. I’m using wacom more than 10 years. I’m still using intuos4 large that I bought it around $800 years ago, after a year the surface wear off, rough surface is gone, it feels like drawing on plastic. Because I like firm pressure, maybe I gave to much pressure to the nip, the pen start acting weird after a couple month, I never drop it btw, change the nip doesn’t help at all, the problem such as double click it self, etc. The nip feels wiggle and fragile, I don’t like this feeling. I’m using Huion H610pro too, I bought it to test the quality before buy a GT-220, it’s cheap just cost $80 include shipping to my country. I don’t know why, but this product is more durable compare to wacom, after 3 years the surface still great, feels rough like drawing on paper. After 3 years the pen start acting weird, I drop it many times from my desk, still it’s much better that wacom products. Their product feels more sturdy, the nip feels solid. When drawing, I don’t feel any differences between this Huion, Intuos4 and Intuos5, the pressure is great. But Huion driver is garbage, tons of bugs, mostly jagged lines, must trying 20 driver version to find the best result. I’m really happy, I’m not buy the GT-220 first! don’t want the driver issues give me a headache. If Huion have a better driver, I will never using Wacom again for sure, because I like to use a lots of shortcuts, my left hand standby on keyboard, so I don’t use the expresskeys and touch ring on wacom products. Thank you for your detailed experience Kris, I agree with almost everything you said, I own a small Intuos 4, and I didn’t have the problem you described, but I don’t press on it too hard, so maybe that’s the problem, I am not sure.